Home lawn soil testing is an easy and handy way to figure out exactly what is going on with the soil under your lawn. Such testing should be a part of your regular lawn maintenance. You can either do home lawn soil testing yourself or get someone to do it for you. To do home lawn soil testing, whether you choose to do it yourself or have someone else do the testing, you need several soil samples from the yard in question. You can either test several spots independently or mix soil from around the lawn to get a general idea of how the whole lawn is doing. Samples should be gathered from two to three inches below the surface of the soil. Use a trowel or a spoon to collect the sample. Don't touch it with your hands as residue from your body, particularly if you smoke, could alter the results. Put each sample in a separate jar and label it according to where it came from. For home lawn soil testing, it is a good idea to take a sample from each corner of the lawn, as well as a sample from the center and another from any place that is very different from the rest of the lawn, such as a sunny spot or a place that doesn't drain very well. Try to get any debris such as rocks or roots out of the soil sample, again without touching the soil. Most soil test kits will ask you to combine your soil sample with water and allow it to settle for a period of time before using it in the test kit. Always read and follow the directions for the kit you buy. If you are sending your samples out to be tested, gather and store your samples as requested. Home lawn soil tests can measure a variety of nutrients in your lawn. The most common tests found in at-home testing kits include the pH level of the soil, as well as levels of nitrogen, phosphorus and potash or potassium. Knowing the pH level of your lawn is important because all plants grow best at a particular pH. If the pH level is too high or too low, your grass will not be able to use the nutrients in the soil and thus will not grow as well as it should. 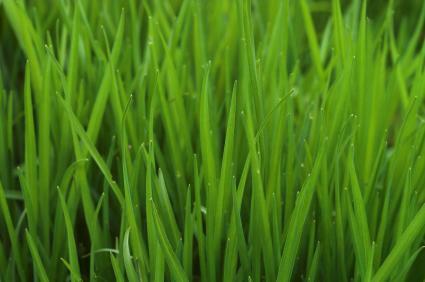 The ideal pH for different kinds of grass varies, but most grasses like an acidic soil. If you find your pH needs to be higher (more alkaline) you can add hydrated lime, or even ashes from your fireplace. To lower pH (make it more acidic), ground rock sulfur is a popular additive, but sawdust, composted leaves and leaf mold are also beneficial for lowering the pH of your soil. It is vital to have the right amount of nitrogen in your soil because nitrogen will make your grass leafy and full. If there's not enough nitrogen in your soil, your lawn will be more susceptible to disease and pest infestation. On the other hand, if there is too much nitrogen, the focus is on green growth at the expense of flowers and seeds. This isn't really a problem for lawns, but it is possible to have too much of a good thing. Especially useful if you are planning to sod your lawn is phosphorus, which stimulates root growth, gives plants a healthy start and makes them mature more quickly. It also helps plants to bloom and form seeds. While this is not so vital in the lawn, it is useful in other parts of the garden. Finally, potassium or potash is helpful for establishing early root formation, which is vital when growing grass from seed. It also helps protect plants from drought and frost and will help make your grass sturdier and stronger. Whether you do your home lawn soil testing yourself or enlist your county cooperative extension service or a private lab to help you, your test results will tell you the pH level of the soil. It will also tell whether you have too much, not enough or just the right amounts of potassium, phosphorus and nitrogen. If you get your soil test done at a lab, you may actually get numbers for these amounts. The home kits will just tell you if the amount is good or not. Once you have these guidelines, you'll want to add soil amendments where necessary to get the soil where it needs to be. You can add nutrients by applying chemical fertilizer or through organic means. Taking care of the soil beneath your lawn will help ensure that you have a lush, healthy green lawn to enjoy without a lot of work.